Meth is a serious problem for the world, and the midwest specifically. No one knows that more than Missouri and Illinois who have tried everything from technology to legislation to stem the tied of stinky, rash covered meth users. …ok not everything. There is one thing Illinois has left in it’s pocket. It’s been afraid to use it up until now, but dammit, it’s time to go all in! See if you can handle this meth addiction! 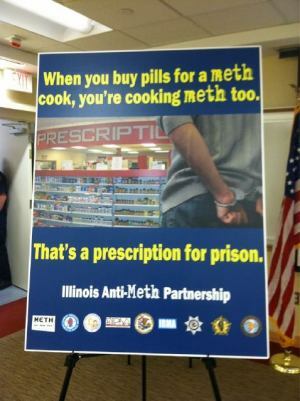 New posters are going up in Illinois pharmacies and drug stores, reminding customers that if they’re buying pills containing pseudoephedrine for meth makers, they are committing a crime. It’s so obvious now. People that do, sell, or supply meth aren’t simply addicted to the money or high, it’s just that they need someone to gently and silently remind them that they are in fact committing a crime! Specifically the posters target folks that are buying pills and reselling them to meth cookers to skirt the legislated purchase limit, since the assumption is that they don’t realize they’re breaking the law, which is really really stupid. …because when someone, who is either a stranger or someone you know makes meth, has you buy something for them because they “can’t” it usually seems totally on the up and up, and not at all weird or illegal. A poster will snap you out of that misconception in no time! Of course the little poster on your pack of smokes, the one about joining the military, or the ones on the highway saying you should eat at Jack in the Box have had no effect on you, but this one is bigger, and on an easel, with “meth” in a crusty font unlike the rest of the poster so you know it’s bad. Yeah, this is totally going to work.